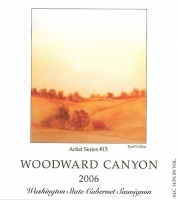 Rick Small’s Walla Walla winery, Woodward Canyon, was one of the first to showcase Washington grapes and winemaking talent. When we opened Salut! Wine Co. in 2002, we placed his 1999 Artist Series Cabernet Sauvignon into a Washington vs. California Cabernet tasting event. We were proud of our state when the 1999 Cab beat Grgich Hills and Ch. Ste. Jean’s Cing Cepages for the favorite wine of the night! The 1999 Artist Series was a hard wine to beat. We tasted and waited as the 2000, 2001, 2002 and 2003 couldn’t quite reach the heights of what had become a tasting classic for the shop. In 2004, a devastating freeze added yet another twist and wrinkle. 2005 didn’t quite hit the spot yet, even though it received great scores. What can I say — we’re very picky. So with eager anticipation we awaited the 2006. Alas, we have a winner! The characteristics are truly representative of the Northwest version of well-made Cabernet — great to drink younger than California versions, more representative of the terroir and vintage, and without the bullying power of tannins and fullness sought in production down south. This is not a California Cab, nor is it trying to be. It isn’t a fine Bordeaux and doesn’t need to be. It’s a reflection of a budding new world-class wine producing region. Drink up the structure and more relaxed lushness of this delicious release. Follow along through the years with later releases of this wine as Rick Small continues to demonstrate how each vintage is different, how great vintages can bring truly wonderful wines, and the heights to which Washington can leap when talent, weather and terroir combine so well. This wine is available at Salut! Wine Co. for $42.99, or available to wine club members for only $38.69!